A Recipe and a Free Book! Join me today at Jennifer Lowery’s romance recipe site by clicking on her name, and find out how to make Zeb’s Bachelor Bruschetta. Just leave a comment on the recipe blog page and you’ll be entered to win a free copy of Seducing Zeb – Book 4 of my Tarnished Saints Series. And check back on my site as Book 5 of the series, Saving Simon, will be released sometime within the next month. Take a look at the Tarnished Saints book trailer video to find out more about the series. I am also in the process of putting all my e-books into print form which will be available on Amazon only. The first five books to be put into print are Familiar, and my Daughters of the Dagger Series: Ruby, Sapphire, Amber and Amethyst. As a bonus, Ruby will also include the series prequel. Watch for the print books to be available starting sometime in the next few weeks. Here is a sneak peek at one of the covers. Enjoy the rest of your summer, and keep on reading! 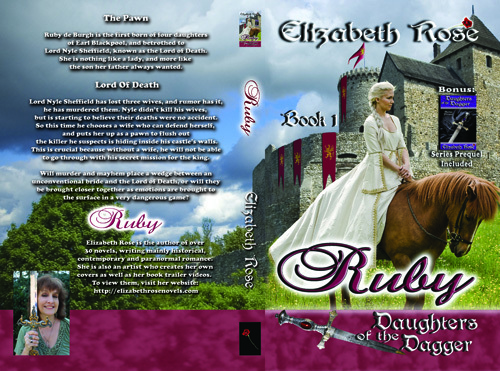 This entry was posted in Contemporary Romance, contest, Free book, guest blogging, Medieval Romance, New release, Paranormal Romance, Print Books, recipes, romance recipes, sneak peek, Uncategorized and tagged elizabeth rose novels, free book giveaway, Jennifer Lowery's recipe site, romance recipes, Saving Simon, Seducing Zeb, sneak peek print book cover, Tarnished Saints Series by Lizrosek. Bookmark the permalink.